This year marks the 20th anniversary of the Glenmoor Country Club and the 18th edition of the Glenmoor Gathering of Significant Automobiles. Over the years, the Glenmoor Gathering has evolved into an automotive celebration spanning several days, including a driving tour, Gala dinners, cooking demonstrations, auction, seminars, art display, and car show. Last year's event attracted 4,500 auto enthusiasts and this year even more flocked to see the 215 automobiles and motorcycles on display. This highlights included the 1935 Duesenberg SJ roadster, more commonly known as the 'Mormon Meteor', which set speed records on the Salt Flats in the 1930's. Another crowd-pleaser was the 1930 Packard 740 Roadster owned by its 102-year-old care taker (Margaret Dunning of Plymouth, Michigan), a job that she has had for 60 years. The Packard was the first car to receive a perfect score—100 points—from the Classic Car Club of America. Another crowd favorite was a 1948 Tucker '48' from the Driehaus Collection in Chicago. They were kind enough to unite the Tucker with its original owner, Rudy Schroeder of Missouri. In attendance was a rare, one-of-a-kind Packard that was built in 1952 for Ed Macauley, director of Packard styling. Intended as a concept car, it was known by several names—Packard Panther, Phantom II and Macauley Special Speedster. The 359 cubic inch Packard eight is bolstered by a McCullocch supercharger. This was the first Packard to feature a wrap-around windshield. The Glenmoor Gathering featured early supercharged cars, Allard Sports Cars (22 of them), the Trans-Atlantic cars (European cars with American engines), Micro Cars, Steam Powered Cars, and 1928-48 American motorcycles. This elegant display of vehicles awaited guests on the spacious back lawn of the country club. On the picturesque front lawn was a spectacular array of supercars, including one of four Lamborghini Aventadors in the United States. The 700 horsepower Aventador can go from 0-62 in 2.9 seconds. Andrew Romanowski, president of the Lamborghini Club of America was also in attendance. This special group of vehicles included more than 20 Lamborghinis, including Murcielago, Gallardo, Countach, Diablo, Jarama, Jalpa and 400GT. Other marques on display include Aston Martin, Spyker, Maserati, Ferrari, Ford GT, DeTomaso (Pantera) and Dodge Viper. The rocket-ship inspired styling of the Tucker Automobile was drafted by Alex Tremulis and featured aircraft-style doors, pop-out windshield, swiveling center headlight, seat belts as standard equipment, and a padded 'safety chamber.' This 'Car of Tomorrow' was priced at $2,450 which was less than Cadillac's popular Model 62 sedan by about $500. The orders poured in, but the Torpedo never reached true production. Indicted for investment irregularities, Tucker was acquitted of all charges, but his company soon failed. The plant closed in mid-1948 after only thirty-seven pilot models had been completed. Loyal workers assembled another fourteen cars. Rudy Schroeder of Chicago acquired his Tucker in a most unique way - he won it in a raffle conducted by his local VFW, which had acquired the Tucker when the plant closed! The car is now part of the Driehaus Collection in Chicago. At this year's Glenmoor Gathering, that Tucker and its original owner were reunited. In 1988 the film Tucker: The Man and His Dream was released by Lucas Films. It told the story of Preston Tucker and his car more accurately than anyone might expect of Hollywood. One of the Tuckers on display at the Glenmoor Gathering was one of three prop cars used in the movie (The car on display is also the only running vehicle out of the three). It sits on a 1974 Ford LTD chassis. The engine and transmission were removed by Lucas Films prior to donating the car to the Ypsilanti Automotive Heritage Museum in Ypsilanti, Michigan. The body and bumpers are fiberglass. Perhaps the greatest tribute an automobile can receive is that it would inspire someone to create a replica. At Glenmoor, a Tucker Replica was present. It was built by Rob Ida in the late 1990s with a design mimicking the Tucker, with a few modern upgrades. It is powered by a twin turbocharged, four camshaft Cadillac V-8. An estimated 10,000 man hours when into creating this tribute. The Glenmoor Gathering display of Tuckers included eight examples (including the replica and movie prop car). If ever there were a group of cars that constantly broke the mold for tradition car design, it was the Micro Cars. The single door BMW Isetta, the pseudo-tuktuk Lambretta, and the dome-shaped Peel Trident, were some of the examples on display of creative thinking. In many cases, the designs were inspired by a desire to create a practical, efficient and affordable car with many born out of dire economic conditions that were prevalent in Europe after World War II. Bicycles and motorcycles were still a popular means of transportation - the microcars were an attractive and affordable purchase adding a few extra creature comforts, and some place to put packages. Between 1953 and 1968 there were over 150 microcar manufactures in Europe. BMW was the largest volume producer of microcars, with 161,000 cars built during the boom. The BMW Isetta helped save the company from going out of business. There were about twenty examples of the Mirco Car on display, including relatively famous household names such as the Crosley Hot Shot, the Nash metropolitan, and the King Midget. For an all-too-brief period in the late 1940s and early 1950s, the name of Allard was one of the most revered of all motor manufacturers. The company's road cars were some of the most popular among wealthy enthusiasts, especially in the United States. The racing versions were more than competitive on the track, and the company's founder, Sidney Allard, was one of Britain's leading competitive drivers, winning the British Hillclimb Championship in 1949 and the Monte Carlo Rally in 1952. More than twenty Allard automobiles were on display at this year's Glenmoor Gathering. One of the highlights was the J2 Allard driven by Erwin Goldschmidt to victory at the memorable 1950 Watkins Glen Grand Prix. The J2 was the most famous of all Allards built, with around 90 examples believed to have been created. Many of the J2s were extensively raced, wrecked, repaired and rebuilt. Most were given a Ford flat-head V8, but some were also built with Cadillac and Chrysler engines. Early in the company's history, they introduced three models: a two-passenger K roadster, the four-passenger L tourer, and the J sport model. This nomenclature continued throughout the Allard line, later adding an M model (drophead coupe) and a P (closed sedan). Many of the cars received Ford components including the Ford V8 engine. The Palm Beach model (of which 2 were on display at Glenmoor) was produced during the 1950s with a contemporary, sporty, small, flowing body shape. Of the roughly 2000 Allards built, it is believed that around 400 exist with the largest amount being in the United States. With over 200 vehicles on the show field, everyone wanted to know which one was the best. For that, the Glenmoor assembled a group of individuals with a wealth of automotive knowledge to judge the cars on the basis of significance, innovation, fabrication, engineering and elegance. The term most often used is 'concours style' or 'French style' of judging. 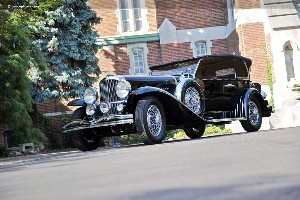 The 1929 Duesenberg Model J Dual Cowl Phaeton by Charles Letts, Jr. was awarded top honors. Mr. Letts has owned the car since 1954.